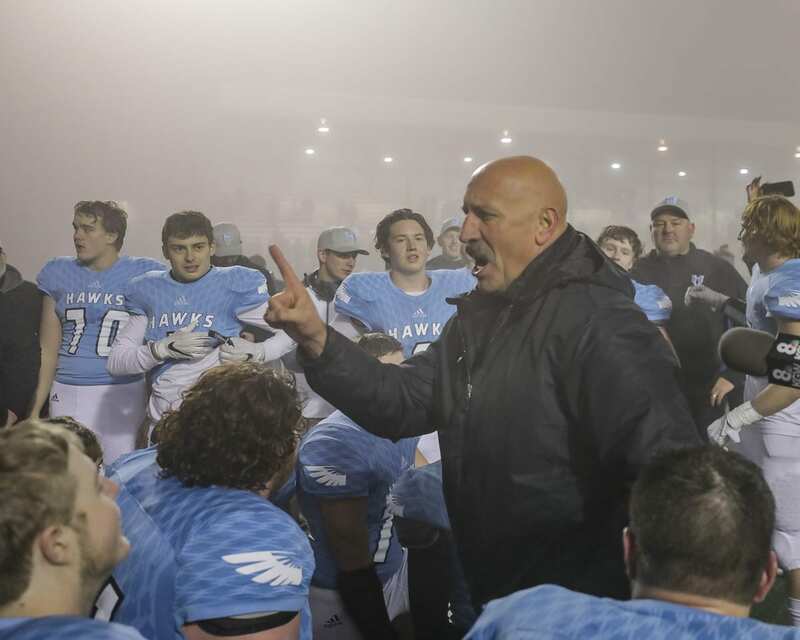 VANCOUVER — The Hockinson Hawks are going back to the state championship game, going to try to extend their amazing winning streak, and they are going to be grateful for the opportunity. After all, Liberty gave the Hawks all that they could handle Saturday night at McKenzie Stadium. 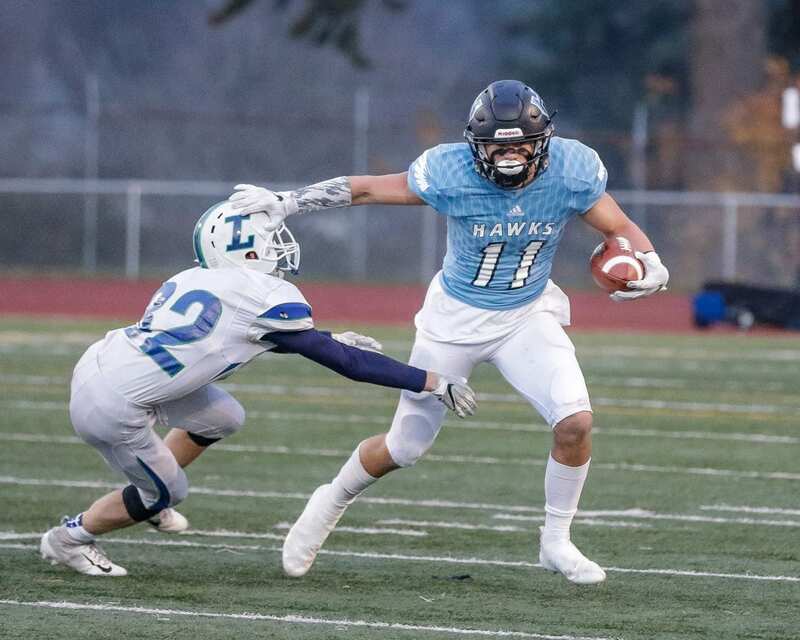 Sawyer Racanelli rushed for two touchdowns, caught a touchdown pass, and threw a touchdown pass as Hockinson rallied from a 17-point deficit to down Liberty 27-24 in a Class 2A state semifinal. The Hawks will face Lynden at 1 p.m. Saturday in the Tacoma Dome. Hockinson, which has now won 26 games in a row, is looking for its second consecutive state crown. He said he hopes to celebrate with the Union Titans, who will be playing in the 4A title game later that night. 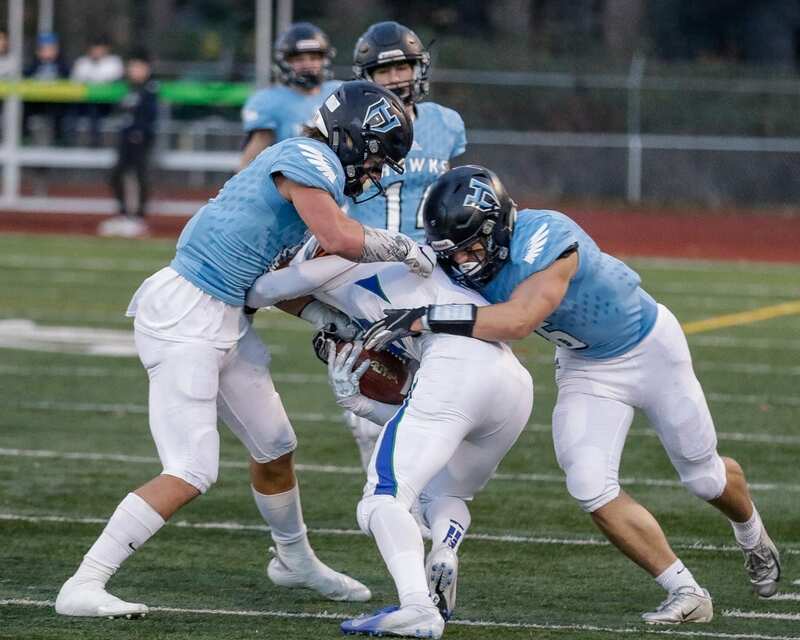 While Racanelli was doing his thing for the offense, the Hockinson defense shut out the Patriots in the second half, allowing the comeback to happen. Wyatt Jones had the interception of the year, even if hardly anyone from the Hockinson stands could see it. His pick in the end zone, as the fog rolled in, stopped Liberty’s effort to go up by by 11 in the fourth quarter. The Hawks would go 80 yards the other way on a 14-play drive to take their first lead of the game. Then Frichtl had back-to-back defensive gems to end Liberty’s last shot. He stopped a fly sweep — a play that had been giving the Hawks trouble for much of the game — and helped turn that into an 11-yard loss. He then was in on one of the next two sacks the Hawks recorded to give the ball back to the offense. From there, Racanelli rushed for a first down to kill the clock and set off a celebration. It was only then that Hockinson coach Rick Steele could relax. “We just made the adjustments at halftime that we needed to do, fix the little things that were stopping us from doing our jobs,” Frichtl said. Hockinson held Liberty to 69 yards in the second half after the Patriots piled up 287 yards in the first half. The comeback started, though, in the closing minutes of the first half. A hook-and-ladder play with Racanelli catching a pass from Levi Crum and then pitching the ball to Jones picked up 33 yards. Two plays later, Racanelli threw a wide receiver pass to Frichtl for a 33-yard touchdown with 12 seconds left in the half to make it 24-14. The Hawks did not get 50. They did need two touchdowns in the second half, and they got them, courtesy of Racanelli in Wildcat formation. The first was a fourth-down run to make it 24-20 midway through the third quarter. Liberty’s next possession got the Patriots to the Hockinson 4-yard line, but then there was a halfback pass into the corner of the end zone, into the fog. A second or two later, the officials ruled the Hawks had a touchback. The Hawks went 80 yards for the go-ahead score, including a 20-yard pass to no one. Or at least no one that anyone could see from the press box. Later, it was revealed it was a 20-yard pass from Crum to Racanelli. Crum finished with 251 yards passing. He also rushed for 66 yards. Racanelli caught 11 passes for 160 yards. Liberty scored 24 points on the Hawks in the first half. Jacob Thoresen had two touchdown runs and Ryan Krischner had a 54-yard touchdown run. The Patriots scored 10 points off two Hockinson turnovers. “They really popped us in the mouth,” Jones said. “I kind of lost my cool a little bit,” Racanelli acknowledged. But he remembered what these Hawks are about and their capabilities. RUSHING: Liberty — Thoresen 8-42, Sam Brown 12-51, Kirschner 7-57, Jake Wright 3-13, Caleb Carr 4-15, Ryan Cain 4-39, Briar Cameron 2-9, Team 1-(minus 1). Hockinson — Jon Domingos 2-9, Crum 12-66, Racanelli 10-45, Cody Wheeler 3-7. PASSING: Liberty — Brown 9-17-0-131. Hockinson — Crum 17-37-1-251, Racanelli 1-1-0-33.